Ostensibly a fiction film about a foster mother (Cherry Pie Picache) in the outskirts of Manila spending her last day with her latest foster child (Kier Segundo), Foster Child is actually a home movie tour de force. It takes a Dziga Vertov or Hou Hsiao-Hsien to make sense out of every aspect of quotidian living, and so Foster Child is merely content with a strong sense of cluttered, bustling place: children running everywhere, playing everywhere, peeing everywhere, and parents wrangling them together for dinner, dances, school, appointments, and trips around the neighborhood. Like Cristian Mungiu did in his recent 4 Months, 3 Weeks and 2 Days, Brillante Mendoza attempts to take the camera from the opening shot of Touch of Evil to quotidian life in the slums. Every once in a while, the four or five Lumière-simple stories swarming around the camera will come together: a three-year-old stands naked in the street and pees, gets washed in a bucket outside, runs (still naked) to join a basketball game in the background, and eventually is retreived by his foster mother. With the open doorways and windows in the hot atmosphere, and the movie’s own real-time experimentation, places and times all seem to merge together throughout; as in Touch of Evil, Foster Child constantly seems to be crossing borders, but unlike Welles’s camera, Mendoza’s is a shambling, sloppy one, lost in the world and totally at peace going wherever, total termite artlessness, which I guess adds to the verité vibe at the expense of form. Or for those Romantic, Foster Child, with all its kids, has something of a child’s raw perspective, moving about in worlds not quite realized or distilled; the lack of privacy so key to its all-inclusiveness, potentially Kafkaesque, is instead completely Edenic, as people piss and eat and raise children together. The ending expounds the point. After an hour-and-a-half of the camera and characters running every which way, the self-effacing foster mother (a non-character given a perfect non-performance by a cringing, Hyena-like Picache) enters a grand marble hotel to offer up her foster kid to a well-intentioned American couple who pass her money and tell her to be in touch via other people. 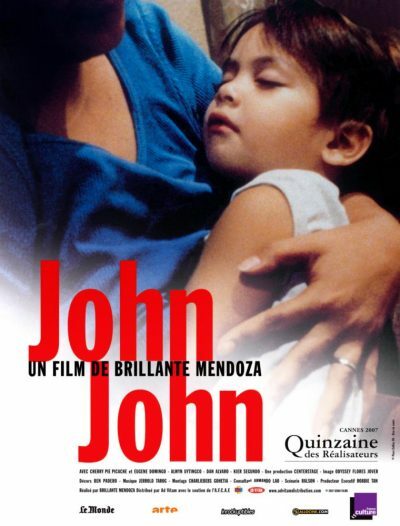 As Picache fumbles with the shower in a failed attempt to clean the boy after he urinates over his new family, and she searches desperately in the hotel suite for a toilet, leaving the door open as she goes, the film turns out to have a message after all: about that which is organic and that which is institutionalized. All this civilization and order and sense, says Foster Child, so that men can piss in dignity.